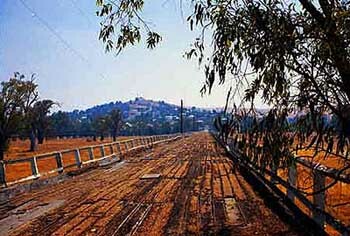 The road to Gundagai: This is the road to Gundagai: at least, it's one of them. Note the remarkable road surface cover: Australian hardwood. It's the only occurrence in Australia of using timber lengths as a road surface we're aware of! From the Australia Day weekend 2004 on 26 January, we'll take the show on the road. We'll travel from Adelaide to Melbourne, Sydney to Brisbane and the Sunshine Coast, before descending on Albury-Wodonga for the Second Annual Rural Australians for Refugees Conference. At Project SafeCom we credit ourselves with having assisted some film makers and current affairs reporters by providing background information that helped to shape several documentaries about Australian refugee issues, and as a result we're able to present several movies and clips in various venues around Australia. Previously these were shown at our September Symposium and events in Fremantle and Bunbury in Western Australia. And, we're hoping to share some ideas in the lead-up to the next Federal election, because we think Australia should have a Parliament for Refugees - see our section Parliament for Refugees. We did make it to Gundagai. 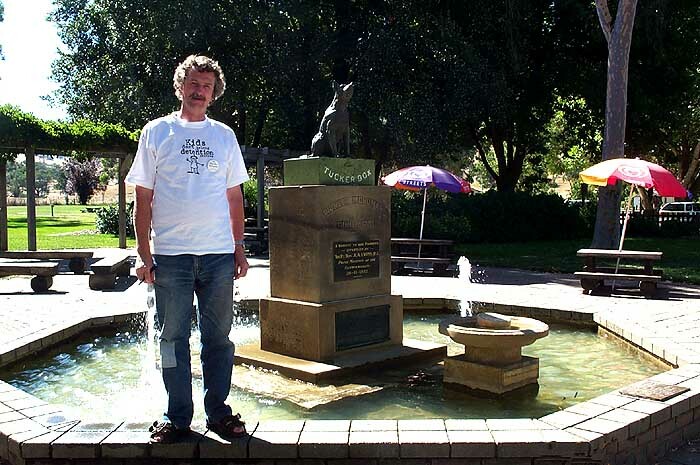 Click on the little image to open the full size picture of our coordinator meeting the "Dog that S(h)at On the Tuckerbox, Five Miles from Gundagai" ... and, a heartfelt thanks to the hundreds of refugee advocates, Project SafeCom members, supporters and friends we met along the way, and who worked to support, build and be part of our events, evenings and meetings! Organisers: ANTaR SA, International Human Rights Day Committee, SA Greens, Australian Peace Committee, Candle-light Walks group, with support and assistance from Tandanya. Contact: Sue Gilbey (08) 8177-0490, Anne on 0416 116 532. Annie Hastwell (MC) (Radio Adelaide, Winner 2002 SACBA Bilby Award), Gordon Barrett QC, John Harley (Public Advocate of SA), Jack H Smit (Project SafeCom) - and a selection of Project SafeCom's documentaries will be screened. Project SafeCom's presentation in Adelaide, by Jack Smit, was both stirring and stimulating. There are so many sides to the refugee debate, and any opportunity to focus on the facts, and not be carried away with just the raw emotion caused by the evidence of injustice, is useful. Featuring: The issue of 'refugees at sea': looking at Nauru's hero Captain Arne Rinnan, his welcome in New Zealand offset against his treatment by Australia, and his final voyage on The Tampa. This is the footage that 98% of Australians missed, and that's unlikely to come to hand again. "The Refugee Action Collective Queensland has been very pleased and fortunate to host Jack Smit of Project SafeCom in Brisbane as a part of his 2004 tour." "Jack is well-known to refugee advocates here, as he his around the country, for his tireless and highly valuable work keeping us up to date with the news as it breaks, and also providing his insightful analysis and clever campaign initiatives. It's true that the refugee rights movement in Australia would not be the same without his amazing work of the past three years." "Being a bloody big continent, we work in physical isolation in cities and localities far apart, so the opportunity to meet well-known advocates from afar is really valuable in terms of cementing the vital rapports campaigners have nationally. At the event we had here for Jack people came from the all around to meet him and hear his ideas. Since then, we are in regular contact with Jack, comparing notes about the campaign, and so his visit has had far-reaching benefits for us as social justice campaigners in Queensland. We love Jack!" Jan - Oct 2004: The 2004 Federal Election: Showing Conscience Parliamentarians - The red section on our website, with almost another 100 pages, is packed with facts and statements by politicians and with our suggested ratings for a Parliament for Refugees, all in the spirit of "WE shall determine who governs this country, and in which way they govern..."
"I had the pleasure of attending a workshop session "The Supporter and The Activist", that was chaired by Jack Smit at the National Rural Australians for Refugees Conference in Albury-Wodonga in January 2004. Jack's workshop, as I recall, explored questions of ways in which decent Australians can give voice to our feelings of distress at the profound cruelties being perpetrated on men, women and children asylum-seekers, in our names, by our present government. How do we channel our anger and shame at these policies in positive, socially productive ways? How do we not give way to apathy and cynicism and disengagement?" Jack didn't "chair" the meeting: he bounced around the room, engaging people with his own enthusiasm and energy, drawing us out, showing that we are all in our own way "activists", no matter on how small a scale. He generated a good positive feeling out of what was potentially pretty depressing material. I was most impressed at his people skills, his capacity to move a large group along in a positive and life-enhancing way. I think it was no accident this his workshop was the best-attended of four simultaneous workshops - he has great skills in what he does, and what he does is in a very good cause. I am glad that the Myer Foundation is supporting his work in the Australian community."